The schedule for the Ducks’ 2015 season has been released, and there are some big matchups you should keep your eye on. The season kick off with the Ducks’ home opener against Vernon Adams Jr.’s former team, the Eastern Washington Eagles. The matchup should be interesting, especially after the dispute between EWU’s head coach Beau Baldwin and the University of Oregon. Depending on which Oregon QB earns the starting job by showcasing his talent in the upcoming spring game on May 2, this game could be especially intriguing. 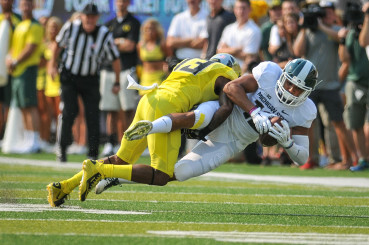 Oregon will head to East Lansing the following week for a rematch against the Michigan State Spartans. Their 2014 early season matchup became an instant classic after Marcus Mariota led the Ducks to a come-from-behind win in Autzen stadium. Troy Hill makes the tackle on a Michigan State player. This year, the Utah Utes will travel to Autzen stadium. The Utes almost came close to pulling off the upset against the Ducks last year, in a game that featured Kaelin Clay’s infamous goal-line fumble. The Ducks eventually beat the Utes 51-27. If I’m not mistaken, the Utes will be looking for revenge this coming year as they travel to Eugene for their rematch with the Ducks. Aside from the usual Pac-12 north matchups against Washington State, Washington, Stanford, Colorado and Oregon State, there are a couple other games to look out for. These marquee matchups against Pac-12 south teams will come against the USC Trojans and the Arizona State Sun Devils. The Ducks will head to Arizona State half-way through the season to face the Sun Devils for the second time in three years. Arizona had a great 2014 season, finishing with a record of 10-3 (6-3 Pac-12). The Sun Devils also finished with the No. 20 recruiting class according to Rivals.com, compared to the Ducks’ No. 17 recruiting class. This is a team on the rise, aiming to add to recent accomplishments with an upset over the Ducks next season. 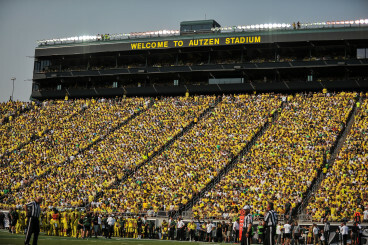 Autzen Stadium during Michigan St. vs Oregon. As for the USC Trojans, the Ducks have not faced them since the 2012 season where they beat the Trojans 62-51 in Southern California. This season, the Trojans will come into Autzen hungry for a win with their No. 1 ranked recruiting class. The Trojans will also look to improve on last season, where they finished with a record of 9-4 (6-3 Pac-12). The 2015 season looks like a challenging one for the Ducks, but also very promising. 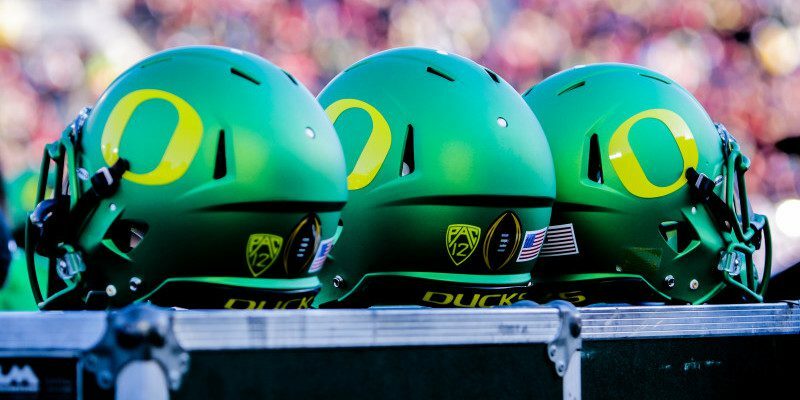 With Oregon’s returning offensive talent along with some new additions, the Ducks will have their eyes set on another College Football Playoff run.